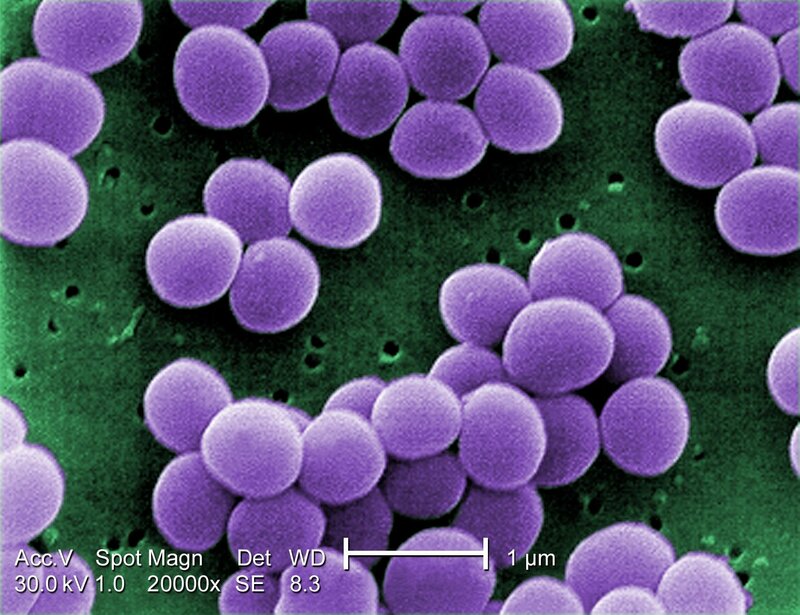 Staphylococcus aureus is a Gram-positive coccal bacterium that is a member of the Firmicutes, and is frequently found in the nose, respiratory tract, and on the skin. Although S. aureus is not always pathogenic, it is a common cause of skin infections such as abscesses, respiratory infections such as sinusitis, and food poisoning. An estimated 20% of the human population are long-term carriers of S. aureus. It is one of the five most common causes of hospital-acquired infections and is often the cause of postsurgical wound infections. The emergence of antibiotic-resistant strains of S. aureus such as methicillin-resistant S. aureus (MRSA) is a worldwide problem in clinical medicine. There are currently (2016) no dedicated antibiotics against drug-resistant S. aureus available. The genome of S. aureus was first sequenced in 2006. From left to right: i) The number of proteins in the reference proteome of Staphylococcus aureus, ii) the number of unique protein sequences for which at least one model is available, iii) the total number of models and iv) a coverage bar plot is shown. The bar plot shows the coverage for every protein in the reference proteome of Staphylococcus aureus for which there is at least one model. Different colours (dark green to red boxes) represent the coverage of the targets. Targets with high coverage are represented in dark green (more than 80% of the target's length is covered by models), whereas low coverage is shown in red. The size of each box is proportional to the number of target sequences with a given coverage. For information on the latest proteome for Staphylococcus aureus, please visit UniProtKB. You can easily download the latest protein sequences for Staphylococcus aureus proteome here. Please note this is for the current UniProtKB release, the numbers in the table below are for the most up to date SWISS-MODEL Repository, which was built on 2019_03. The plot shows the evolution over years (x-axis) of the fraction of Staphylococcus aureus reference proteome residues (y-axis) for which structural information is available. Different colors (light blue to dark blue) in the plot represent the quality of the sequence alignment between the reference proteome sequences (targets) and the sequences of the protein structure database (templates). Alignments with low sequence identity are displayed in light blue, whereas alignments with high sequence identity are depicted with dark blue in the plot. Target-template alignments were computed using HHblits. NR20 database was used to calculate profiles to search a database derived from all unique PDB protein sequences.